Barkevious, now known as Larson, hit the jackpot! Just adopted by Susan Mather he has two other senior dogs he lives with, a Lab mix and a Dachshund. Susan has been behind the scenes helping ABR for some years. She was always caretaker for one of our foster homes when they were out of town and she helped that foster get a couple of Boxers adopted! 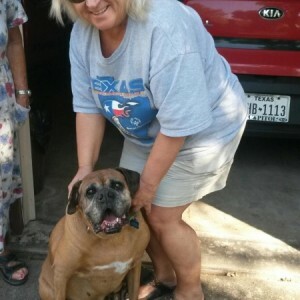 She loves the senior Boxers and is going to be a wonderful home for Larson. Thanks Susan!